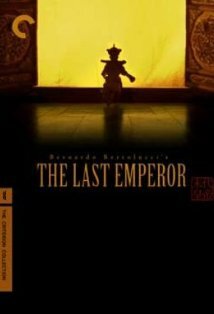 The Last Emperor is a study of the follies of historical human obliviousness. Pu Yi was the last emperor of China. Born into a life of unlimited power, adoration, corruption and decay - Pu Yi attempts to grow up and take his inevitable place as the head of one of the largest kingdoms in history of the world. Simultaneously the world around him is changing. His kingdom is no more, the economic order of the country is in upheaval, and the world is heading towards its first major war. But ensconced in the lap of luxury in the Forbidden City the child emperor has no inkling of it all. The movie is a powerful historical portrayal of the life of the last emperor of China. In addition to being historically accurate, the movie also carries the burden of exploring the psyche of the child and the man who lost more than probably anyone else in the history of mankind. And it is this complexity of subject matter that tends to make the movie and tad difficult to approach. Without appropriate historical background, there is a lot in the narrative that is lost on the ordinary viewer. Cinematically the movie is beautiful. Luxurious sets, elaborate dresses and wonderful acting all combine to make it an absorbing watch. The plot as it unfolds from the point of view of a young child separated from his mother, to the spoiled young man, a manipulated ex-monarch and a wizened old man is well written and still better executed. The only sticking point in the movie for me, was the choice to use English indiscriminately, as an attempt to make the movie more accessible. While the choice makes the movie more accessible, it also makes it seem that much inauthentic. I first saw the movie more than 10 years ago. The thing I remembered most about the movie was that I had witnessed something seminal, even though the story did not stick with me. When I found it on Netflix, here was an opportunity to watch the movie once again and correct a distorted view through my own past. The strength of movies like the Last Emperor, lies partly in the power of the historical narrative and partly in the ability of the audience to relate to the times. The history is unparalleled. But the focused narrative built around Pu Yi, almost a century afterward, does present some cultural challenges that makes you walk away from the movie feeling as if you are missing something. Watching it a second time did not quite cure that for me. That, for me, is a measure of both its strength and weakness.